The 2019 parade season is starting up soon. We hope to see you there supporting the CSFD and all other participants in the parades. If you have any photos you would like to share, check us out on Facebook! With the warm summer weather, heat exhaustion, heat stroke or other serious health concerns can sneak up on you. There are steps you can take to prevent heat exhaustion as you enjoy the summer weather. - Visit The Red Cross for more information to stay safe during the summer. Please remember to keep fire hydrants clear during the winter months. You never know when a hydrant will be needed for an emergency. The valuable time saved by residents clearing hydrants throughout the winter can save a life. 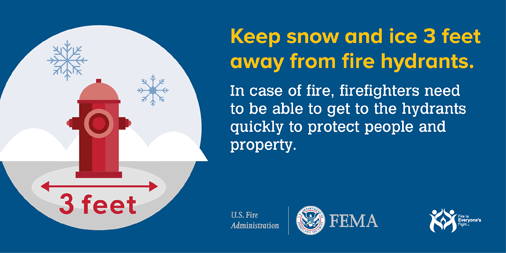 When you see a hydrant with snow around it, take the time to shovel around. The snow should be clear 3 feet around the hydrant and all the way to the road. Driving in the winter in update New York can be hazardous during times of sever winter weather. There are steps you can take to prepare your vehicle for winter weather driving. Understanding how to drive in winter weather is just as important as preparing your vehicle. Check out the National Safety Council for information on preparing your vehicle for winter driving and other steps you can take to make winter travels as safe as possible. October 8th to October 14th is Fire Prevention Week. In a fire, every second counts! A few easy steps to take to help your family escape a fire in your home. 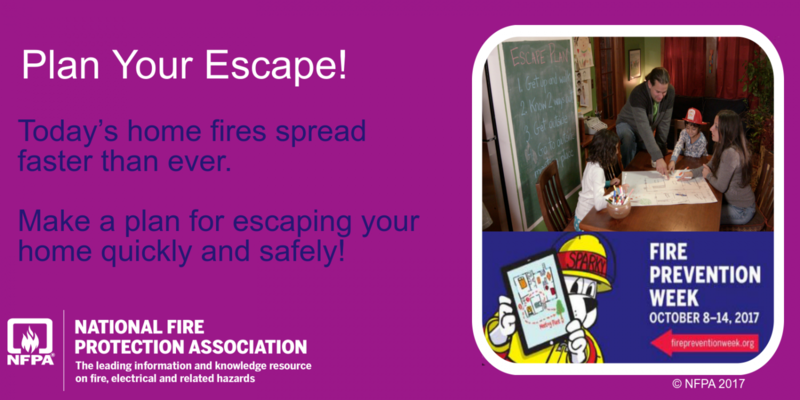 "Make an Escape Plan" - Make a plan for escaping your home quickly and safely. 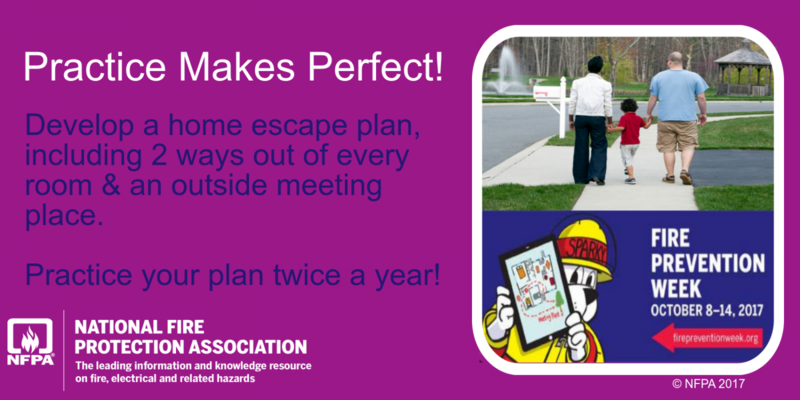 "Practice Makes Perfect" - Develop an escape plan, including two ways out of every room and an outside meeting place. 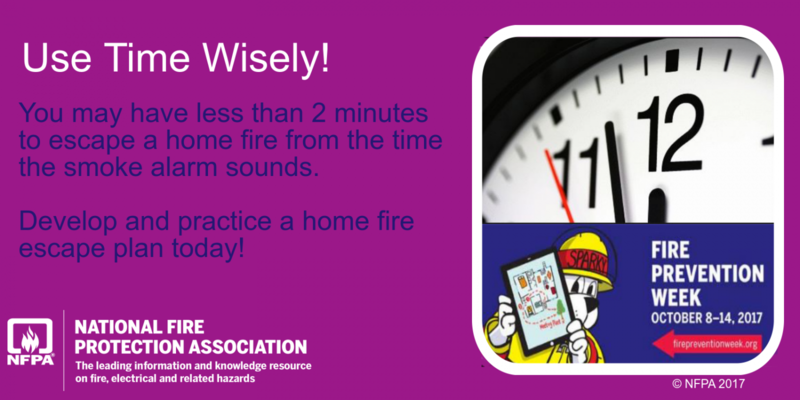 "Use Your Time Wisely" - You may have less than two minutes to escape your home from when smoke detectors activate. Please watch carefully for children near school buildings, in areas where school buses are traveling or where there are signs for school zones or bus stops. Remember that if you are approaching a school bus from either the front or behind, and it's yellow lights are flashing, the bus is preparing to stop. If the buses red lights are flashing, YOU MUST STOP. ITS THE LAW! This includes buses that are: on the opposite sides of a divided highway, on multiple lane roadways, in parking lots and on school grounds. Check out this link for more information. Smoke detectors that are properly installed and maintained play a vital role in fire safety. Having a working smoke detector cuts the chances of injury or death in a reported fire in half. It is very important to test your smoke detectors each month. Download the "Smoke Detector Tear Sheet" by Clicking here and have your children color the picture to help teach them the importance of smoke detectors in your home! For more information visit the website by Clicking here. Carbon Monoxide (CO) Detectors are required by New York State Law to protect you and your family from carbon monoxide poisoning. With heating season just around the corner, household heating equipment will be fired up. Household heating equipment is one of the greatest risks for producing CO within residential dwellings. 1. Dead batteries or aging detectors that are inaccurate and give false alarms, 5-7 years is the maximum expected life span. 2. Improper placement - they should be 15 feet away from any source of combustion gasses to avoid false alerts. 3. Failure to clean dust etc from the detector on a regular basis - yielding false alarms.